Visit any photo forum that discusses Leica film cameras and you’ll hear it time and time again: the first thing you need to do when you buy a used Leica is to send it to someone for a “CLA” (clean, lubricate and adjust). In the religion that is Leica, this notion has reached the status of revealed truth, questioned rarely, if at all. Like many faith based claims, its built on received certainties and little else, certainly not the facts as they present themselves in practice. The bottom line is this: given the operating tolerances of finely tuned mechanical Leicas, its better not to open up a sophisticated device like a Leica film camera without a legitimate reason to do so. “Legitimate reasons” might include hanging slow speeds, or stuck shutter, or a dim viewfinder. But, absent these, you’re throwing away your money while subjecting your camera to potential harm. Ham fisted attempts to clean and adjust are legion, and unless you’re sending it to Leica (read: extremely expensive) or a reputable third party tech like DAG, Sheri Krauter (read: slow and expensive) or Youxin Ye, you’re just as likely to receive your Leica in worse condition than before you sent it away. I like to buy used Leicas on Ebay. If you know what you’re looking at, you can still score some serious deals, but invariably it will involve the old Leica with matching lens and case that has been sitting unused in a box in the closet since grandpa died in the late 70’s. The worse the accompanying pictures of the item, the better the potential deal. If most of the description involves the camera case and how beat up it is, or ignores the collapsible Summicron while spending inordinate time describing the accompanying dead Leicameter, you’re potentially in for good luck, because you’re clearly dealing with a seller who can’t discriminate between what’s valuable and whats not. You’d be surprised by how nicely an old beater with cracking vulcanite, covered in decades of accumulated dirt and brown gunk in the body crevices will clean up with some lemon juice and a griptic covering from cameraleather.com (assuming cameraleather.com sends it to you within the next 18 months, but that’s another story you can learn more about with a quick google). Conventional wisdom holds that such a camera will need to be CLA’d immediately otherwise your new Leica will be worthless. In my experience that’s rarely the case. Even for cameras that have sat unused for decades a CLA is unnecessary, even if the slow shutter speeds may initially be a little funky ( and usually they’re not). Most cameras just need use; the shutter mechanism needs to be exercised regularly to loosen up the stiffened lubrication. Usually a few days and a couple of hundred cycles of the shutter and,voila!, the slow speeds are working fine, or at least close enough to be within the margin of error. For that matter, who really cares if the 1/2 sec is a wee bit off sometimes? When was the last time you shot under 1/15th of a second anyway? Probably never. As for accompanying optics, a good careful cleaning with a Lens Pen ( my favorite photo accessory of all time) and your front and real elements should be clean and smudge free. Of course, the lens itself may need disassembly and cleaning if its fogged or has fungus, or if the heliocoils are bound up, but usually you can get a good enough eyeball view of the lens when listed by the seller to get a decent sense of whether the optics are good. As for scratches and internal dust, well, ya takes your chances, but almost all optics older than 20 years are going to look pretty bad when you shine a flashlight into them. Yet, remarkably, most of them still look fine to the naked eye (how we used to judge them back in the day) and take good photos undifferentiated from a like model in “mint” condition. Lenses are to be used, not to shine flashlights through. If the lens is to be used with film and wet printed, stop worrying. A little internal dust (commonplace on vintage lenses) or some cleaning marks or scratches on a front element won’t make a bit of difference except in your head. If you’re a 100% magnification pixel peeper type, well, move along. I suspect you’re not going to be interested in vintage optics anyway, and if you are, well, that comes along with the territory. 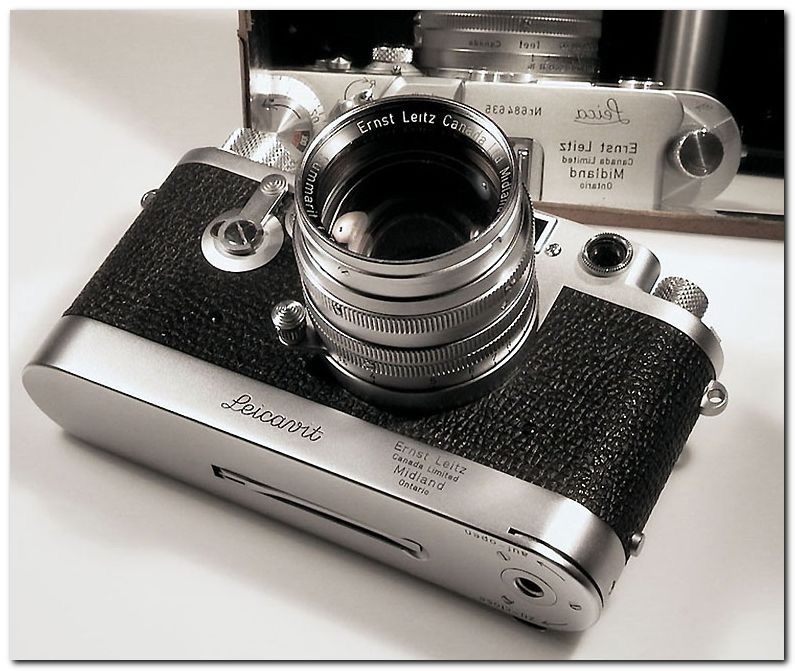 This entry was posted in Collectible Leicas, Film photography, Leica, Leica Camera, Leica Film camera, Leica Rangefinder and tagged Leica CLA on September 30, 2015 by Leicaphila.